Former Inter captain Mauro Icardi is "super happy" at the Serie A club, according to his wife and agent Wanda Nara. 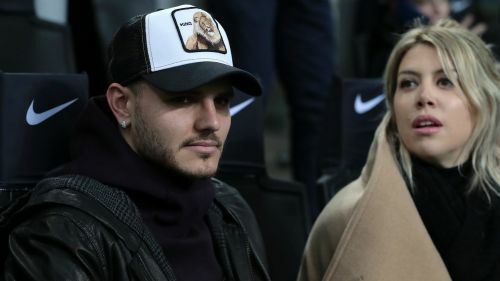 Icardi has been linked with Juventus, Napoli, Real Madrid, Barcelona and Manchester United after he was stripped of the Inter captaincy earlier in February. The Inter star – who is contracted until 2021 – has not played since losing the armband to team-mate Samir Handanovic. Despite the uncertainty over the 26-year-old's future, Nara insisted her and Icardi are happy in Milan. "The truth is that Mauro has two more years left on his contract with Inter and we're super happy here," Nara told Gente. "Milan is like my second home and all my children are Italian. The only one born in Argentina is Valentino, but we came here soon after. "There's a lot of talk about whether we'll move or not, but perhaps the press are the ones who are pressing the most..."
Nara has been criticised for her role in the situation involving Icardi and Inter but the outspoken representative added: "This is a very macho world and what I'm doing is revolutionary. Although there are many relatives who represent players, the role of women in football is more linked to 'staying at home with the kids and keeping quiet'. "That's why I'm a revolutionary. I have friends who are wives of players and many laugh at me. They see that what I'm doing is strange, but they've asked me to represent their husbands because they know me, they know how I act and defend my interests. "There is no crisis with Mauro, nor was there one. The stories that have come out are fantasy and very little to do with real life. We're really happy together. "It's very difficult to be a woman in this macho world, but I have people who respect me. Some people have made things up to destabilise me. They've got very far."